With the development of the vape device market, increasing released vape mods have a similar design, features, and power output. To release a distinguished mod is the goal for most vape manufactures. The Graffiti 220w from Vzone is such a version of the mod. Here comes the Vzone Graffiti 220W Box Mod in Gun Metal. The Box comes with a package just like the wardrobe in Black and Green. 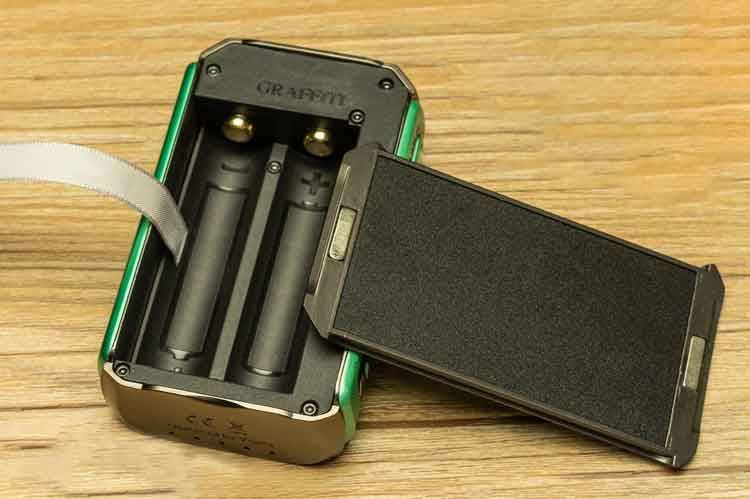 In the package, we can get Graffiti 220W Mod, USB Cable and a User Manual. The USB cable comes with Nylon knitting style which is more durable in use. Even it has no much influence on using the cable. It indicates vzone care about the user experience. Its an extra point for the kit. The Mod comes is made from Zinc alloy and PC in 90*56*26. It is a common size for the dual battery. The round corner design is good for holding the mod without any hard feeling. With the batteries in, it is a little bit heavy for ladies but not for men. 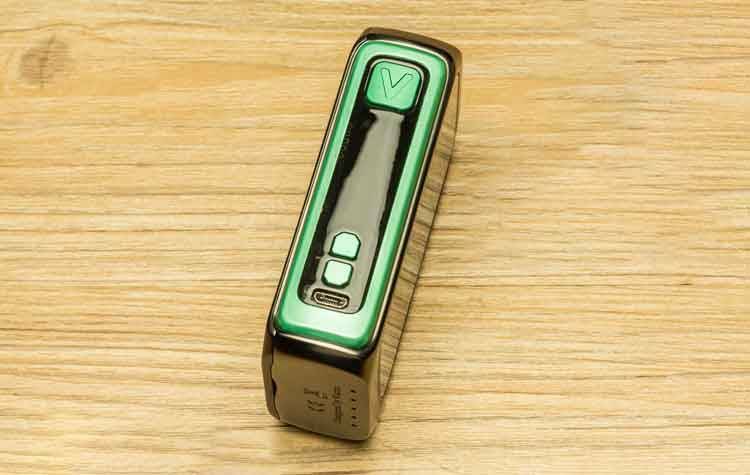 The Mod comes with a contrast color with green and gun metal. With the skull design on the back panel, it is very attractive in visual effect. 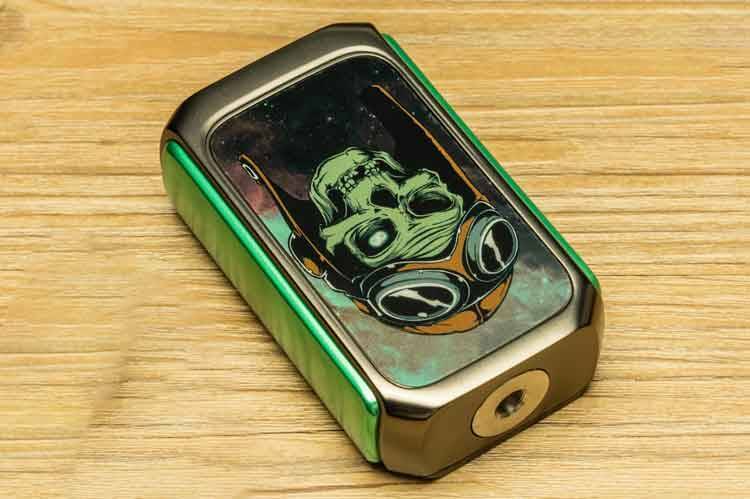 With the Graffiti on it, when vaping with it, you have to avoid putting it with sharp objects or the mod would get scraped. The 510 spring pin connector is in the middle of the mod top, with a 26mm diameter, it is compatible with the most popular atomizers. It has a great view effect in stain steel atomizers. On the button is the heat release slot and Words“Designed by Vzone” printed on it. On the side is the fire button and adjust button. It has a quick response. There is a crack between the button and the mod when shaking the button. It makes a noise. The battery door attached with magnets. An improvement for is needed for the battery door and mod. It is a rather easy thing to run the mod. Five clicks for turning on or off the mod. 3 clicks for entering the menu. Just like the most mod in the market, it comes with TC mode, VV mod TCR mode and craves mode. You can adjust the setting according to your vaping habit. For the performance, the max output 220W meet the demand for daily vaping. The quickfire response and multi vaping setting available make it excellent enough for daily using. In all, If you do not know how to choose among so many mods in the market and have no very strict requirement on the performance, you can have a try with this mod for that it has an excellent design and great performance.